"A nutritional powerhouse. If the pudding is deemed to be too thick, you may add additional milk to the mixture until desired consistency is achieved. Enjoy with the fruit of your choice. You can substitute maple syrup for the honey, if desired." Whisk soy milk and Greek yogurt together in a large sealable container. Stir hemp seeds, flax seeds, honey, cinnamon, and vanilla extract into yogurt mixture. 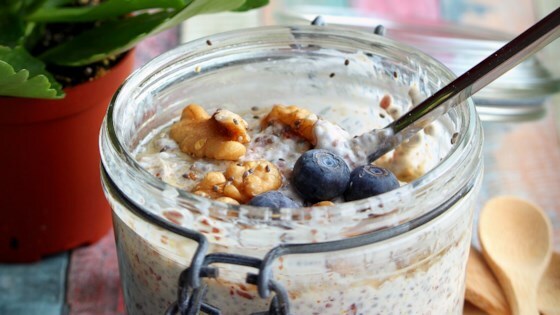 Stir chia seeds into yogurt mixture until seeds are evenly distributed. Cover the container and refrigerate for 15 minutes. Stir mixture until chia seeds are evenly distributed again. Refrigerate until chilled and set, at least 1 hour. See how chia seeds make a yummy, healthier chocolate pudding.